On January 11, the U.S. Department of Defense published new statistics on domestic military drone operations. According to the data, which cover missions that were authorized during Fiscal Year 2018, the U.S. military engaged in 11 domestic missions. Most of the these missions fall under “Defense Support of Civil Authorities,” a DoD process that determines when and how military assets may be used to assist civilian authorities during a crisis or natural disaster. The drone operations in FY 2018 included three year-long missions and eight short-term missions, which lasted on average nearly 3 months. The data reflect a significant increase in the length and frequency of domestic military drone operations compared to previous years. In a dataset published in mid-2017, the DoD recorded just 11 missions between 2011 and 2017. (Neither dataset includes operations of the Department of Homeland Security’s fleet of MQ-9B drones, which are used to routinely patrol the country’s land and maritime borders). These included one year-long mission in 2016-2017 and 10 short-term missions, which lasted between one and 13 days. 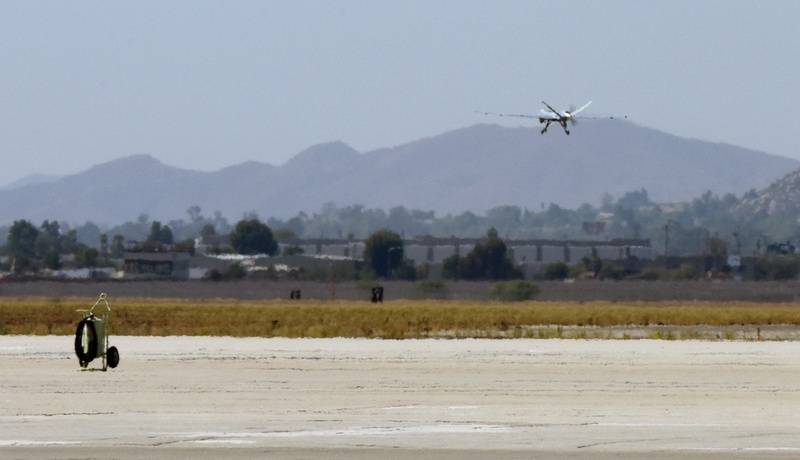 In contrast, DoD unmanned aircraft were deployed for months at a time in 2018 to support domestic missions. This growth in operational tempo could be a function of the DoD’s multi-year plan to allow military drones more routine access to the National Airspace System. It may also reflect the Air National Guard’s desire to make more use of its drones to support domestic needs. Or it could equally be a consequence of an especially severe fire season and the Trump administration’s decision to deploy the U.S. military to the southern border. This upward trend is likely to continue in coming years thanks to a DoD policy shift implemented in August of last year that could make it easier for military drones to be deployed at home. Previously, all domestic drone missions had to be approved on a case-by-case basis by the Secretary of Defense. Now, as a result of the new DoD policy, some missions can be approved by state governors, Geographic Combatant Commanders, and other authorities, depending on the size of the unmanned aircraft and the circumstances of the mission. If the documents do not immediately appear, please refresh the page or click the “download” link.